A while ago my friend asked my advice on where to buy art as she has lots of bare walls to fill. I have a lot of things on my walls, but I don't actually have any paintings or big pieces of 'art', per say. I sent her this blog post I wrote about ways to create affordable wall art, which are definitely things I do in my own house - see here and here! I also think that social media is amazing for finding artists; I commissioned a couple of SE London-based artists who I found in the most random way ever - a true digital paper trail, if you will - to do these chalk drawings for me, so bear with me as the story is a bit convoluted! I found an interior design duo called 2lovelygays via Twitter and started following their Forest Hill coffee shop, St David Coffee House, on instagram. I haven't actually been, but owning my own cafe is my recurring daydream and this place seems awesome - they open into the evening, serving small plates and wine, and have different pop-ups some nights of the week. 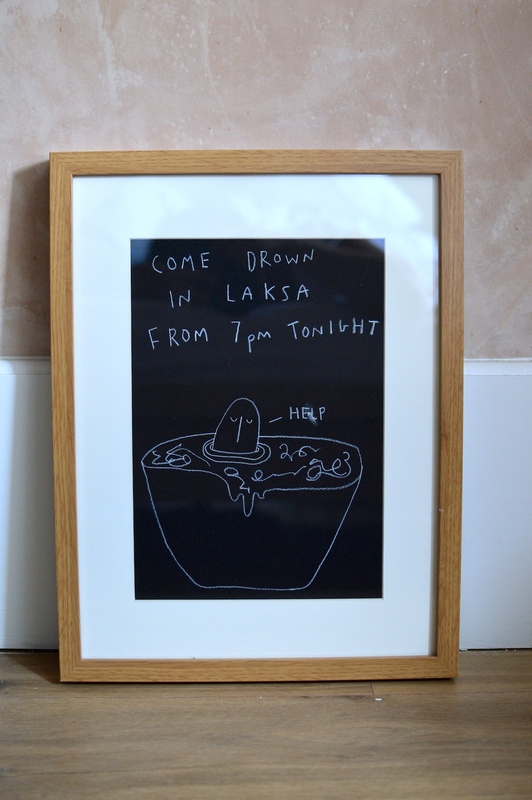 I started following one of the pop-ups, Nyonya - a guy serving Malaysian laksa - and became totally obsessed with the chalkboards he has every week outside the shop. Long story short, I tracked down the illustrators - Joe Gamble and Alice Bowsher - and e-mailed to ask them if they'd recreate a couple of the boards. They arrived in the post a couple of weeks ago (I also got an extra of the one above to give to my brother for his birthday) and I think they look so smart, even just in cheapo IKEA Ribba frames (which I use for everything). Actually I got carried away and I don't really have space for three, but they are just so random and clever, I couldn't help myself! Plus, I'm half Malaysian so they are quite sentimental - that 'It's OK' line is something that my relatives say that drive me crazy, so when I saw the chalkboard version I had a good chuckle. 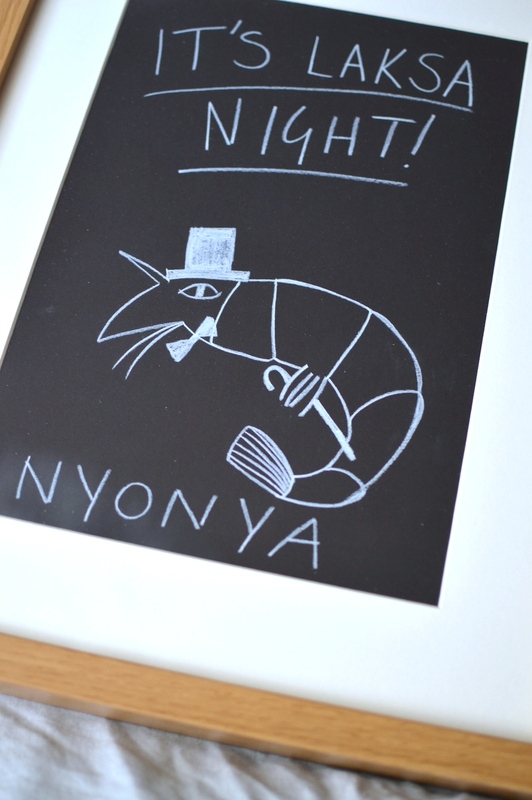 Oh what an awesome story behind your original artwork. I love it when art is personal, that's what makes a house a home.